Great coffee! Cheaper than Starbucks. I would recommend. Love Dunkin Donuts coffee but the prices are getting a little out of control! This used to be my go to coffee but now I am switching over to other brands now because of the price! This is one of my favorite coffee brands. It is smooth, has low acidity and doesn't bother my stomach like other brands do. I recommend trying this if you want to get away from bitter coffees. I LOVE DD. I couldn't imagine a place with better coffee. They have great people and great tasting coffee! Love this coffee! Cheaper than Starbucks and in my opinion better! I LOVE Dunkin hot coffee. Extra large extra cream is my usually order. 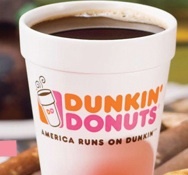 Dunkin has a smooth flavor like no other and is cheaper than other coffee shops. Love Dunkin Donuts!! They have the best coffee and its not expensive at all! For me it tastes better than all of the expensive coffee shops like Starbucks!! My favorite is Iced Caramel Latte!! how can you go wrong with Dunkin Donuts coffee!!! just what i crave in the mornings!! I love Dunkin Donuts coffee. My only complaint is that it tastes different from each location. It is never made the same. Extra sugar here might mean no sugar there and so on and so forth. Flavor wise, the coffee is spectacular. You can't compare it to any convenience store brand. Dunkin is legit in the flavor department for sure! I just wish they had a better system to regulate the way it would taste when an individual makes it for you. This might be my favorite coffee shop. It is great coffee and it is affordable! I love Dunkin Donuts! I never really liked coffee until I started drinking their flavored coffees. Delicious! I also love their donuts especially the lemon-filled donut.